The “Big Day” concept took a hit on Travers day. The notion of packing a bunch of Grade I stakes on a single day was designed to ensure a high handle even if a marquee star – a potential Triple Crown winner or actual winner – isn’t going to appear. Last year, of course, American Pharoah won the Belmont and ran in the Travers. With no superstar in this year’s Travers, attendance did not hit NYRA’s self-imposed cap of 50,000 and handle was down 9 per cent from 2015. What NYRA loses when it loads Grade I’s onto a single card is the ability to promote other stars of the sport and grow fan interest. When it’s the Travers, a Flintshire or a Lady Eli isn’t going to fit NYRA’s promotional agenda. But you have a turf star and an undefeated filly who survived a life-threatening illness to come back after a break of over a year. Each could have been the object of a marketing campaign that might have produced buzz on a day other than the Travers. The Travers is an event that will draw a substantial crowd whether there are six other graded stakes on the card or none. The handle from a stakes-heavy card, however, is going to be substantial when off-track bettors are added in. NYRA is missing an opportunity to draw interest when the Grade I events are put on a single day instead of being spread across the calendar. There was a time not too long ago when every day at Saratoga was a big day. 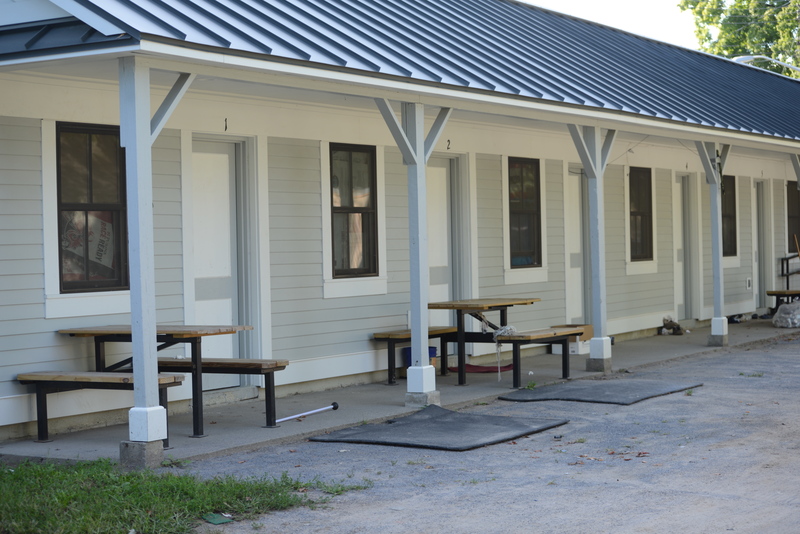 NYRA has done a great job improving living quarters for back stretch workers. I guess I am paying more attention to the Oklahoma training track now that I have a couple of horses over there. I knew about the new dormitories that were built recently, but missed the refurbishing of existing dorms. 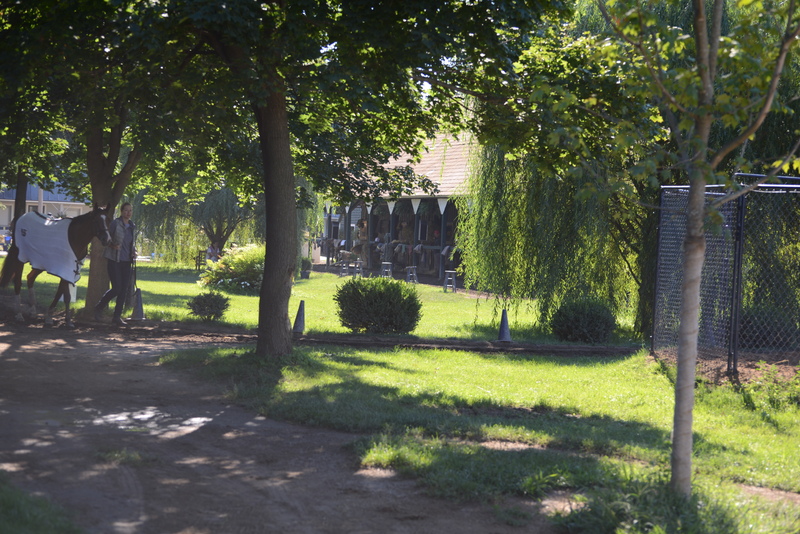 I haven’t been inside them, but the exterior structures and the addition of air conditioning are a commendable improvement by NYRA to improve the conditions of those who are with the horses 24/7. NYRA needs to work on its treatment of trainers. 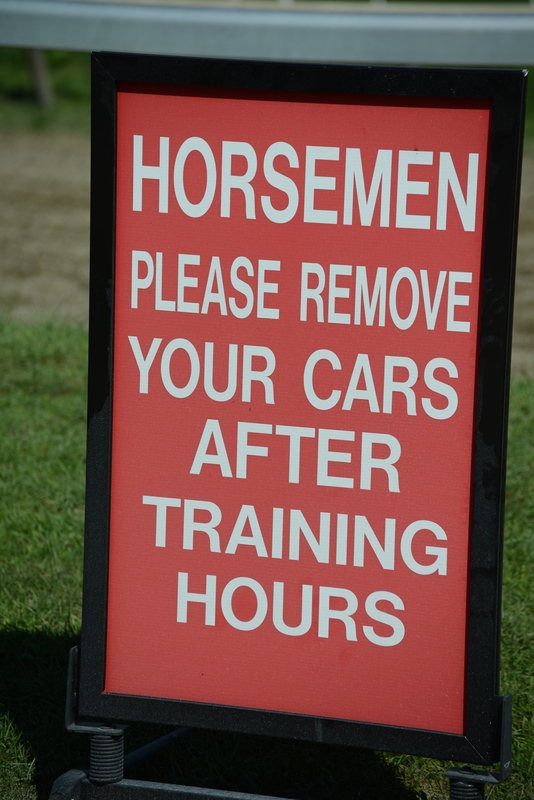 This sign is along the rail at the Oklahoma Training Track in an area used by trainers and owners to observe their horses working out. In late morning it becomes a parking lot for fans. When I was there Wednesday at 9:30 – as fans were arriving and training hours were coming to an end – there were all of eight cars that presumably belonged to owners or trainers. The sign is obnoxious and rude. Most trainers – not the Bafferts, Pletchers and Browns – have small operations and are struggling to get by. They are often at their barns from sunrise to sunset. If they could park closer to their barns, they rather obviously would, so the sign is not necessary. There is another issue, however, that rankles trainers even more. NYRA seemingly cannot produce timely condition books. For those not familiar with the term, a condition book is a schedule of the races NYRA intends to run over a period of several weeks. It is a most essential tool in planning the training of a horse since it enables the trainer to pick out a race and train his charge accordingly. NYRA, however, is notoriously late in releasing them. The Belmont meet is a week away. The condition book was just released on Tuesday. It’s time for Chris Kay to stop talking about his museum. At this year’s Jockey Club Round Table – a prominent national forum – NYRA’s CEO was a featured speaker. In describing NYRA’s capital improvements, the first two he identified were his own creations, the so-called Walk of Fame incorporating the Red Jacket winners and the Durkin Replay “Center.” The Durkin Replay “Center” is a monitor affixed to a pillar in a bar. The Red Jacket ceremony is a superfluous event recognizing people who are in the Hall of Fame located across the street. This year’s Red Jacket ceremony was an interminable production between races that delayed the start of the next race. No one goes to the Walk of Fame. 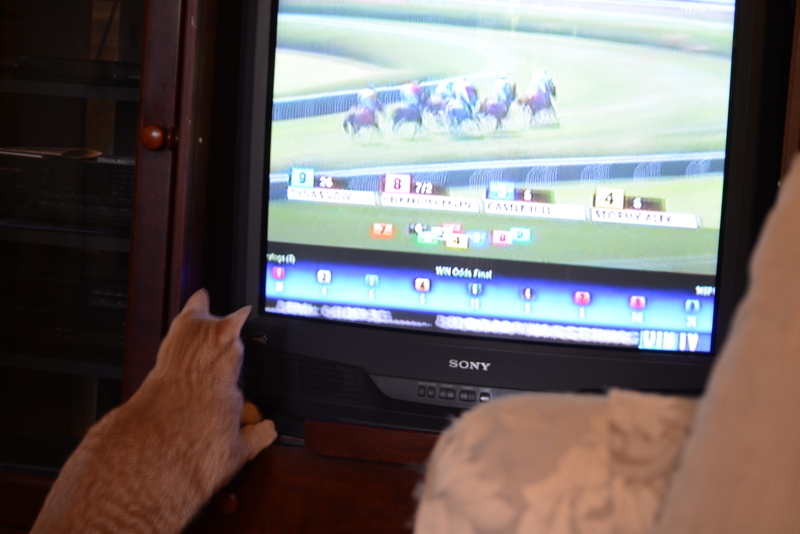 Will NYRA start counting cats in the attendance figures? ← Where is our country going? If trainers would park like regular people in the direction that cars park in the lot rather than pulling in front first into the rail then maybe the sign wouldn’t be needed but the way trainers and owners park they take up 60-70 parking spots each morning.